Dinosaurs are a group of land-dwelling reptiles which had some unique anatomical features that distinguish them from known living reptiles. Like all reptiles, dinosaurs were vertebrates, air-breathing, and had scales. They laid eggs, just like most extant reptiles. But dinosaurs had some features that are not found in known living reptiles – namely a unique hip structure. Modern reptiles have a hip design that places their hind legs out to the side, giving them a sprawling structure. But dinosaurs had their legs underneath their hips, giving them an upright posture. So, dinosaurs were not merely larger versions of modern reptiles, but were a unique design of reptile. Note that flying reptiles such as the Pteranodon are not technically dinosaurs since they do not have the required hip structure. Likewise, sea-dwelling reptiles such as plesiosaurs and ichthyosaurs are not true dinosaurs because they are not land animals. However, these creatures are often included in books on dinosaurs. Taxonomically, dinosaurs are a superorder consisting of two orders: saurischia and ornithischia. Saurischian dinosaurs are called “lizard hipped.” This name is somewhat misleading because, as mentioned above, their hips are designed for erect posture and not for sprawling. However, in saurischians, the pubis bone points forward, away from the ischium as it does in lizards. Conversely, ornithischian dinosaurs are called “bird-hipped” because they had a pubis bone that points backwards along with the ischium as it does in modern birds. The lizard-hipped dinosaurs are divided into two main branches: Theropods and Sauropodomorphs. Theropods were bipedal and included varieties such as Tyrannosaurus rex, Velociraptor, Deinonychus, Dilophosaurus, and Compsognathus. Sauropodomorphs were quadrupeds with long necks and long-tails. They include varieties such as Apatosaurus, Brachiosaurus, and Diplodocus. Thyreophora, Marginocephalia, and Ornithopoda comprise the bird-hipped dinosaurs. Thyreophora refers to the armored dinosaurs, such as Ankylosaurs and Stegosaurs. Marginocephalia includes both the horned dinosaurs, referred to as Ceratopsians (such as Triceratops), and the bone-headed dinosaurs (Pachycephalosauria). Ornithopoda includes varieties such as the Hadrosaurs (“duckbilled dinosaurs”), and Iguanodons. It seems that what most people think they know about dinosaurs comes from what they have seen on television or at the movies. They “know” that dinosaurs went extinct 65 million years ago and that some dinosaurs evolved into birds because they have seen Jurassic Park. But discerning thinkers will consider the actual fossil evidence as much as possible. And since most of us don’t have easy access to these fossils and are not trained in paleontology, we rely on the experience of scientists to guide our thinking. The most careful and discerning thinkers will also consider the worldview of any science experts, and how this might affect their interpretation of the evidence. A correct view of history can aid our interpretation of when dinosaurs lived and how they died. Incorrect views of history can just as easily hinder drawing correct interpretations of data. A paleontologist with a tenacious commitment to the philosophy of uniformitarianism will often draw very different conclusions from a paleontologist open to catastrophic processes. The fossils are the same. But different worldviews will lead to different conclusions. 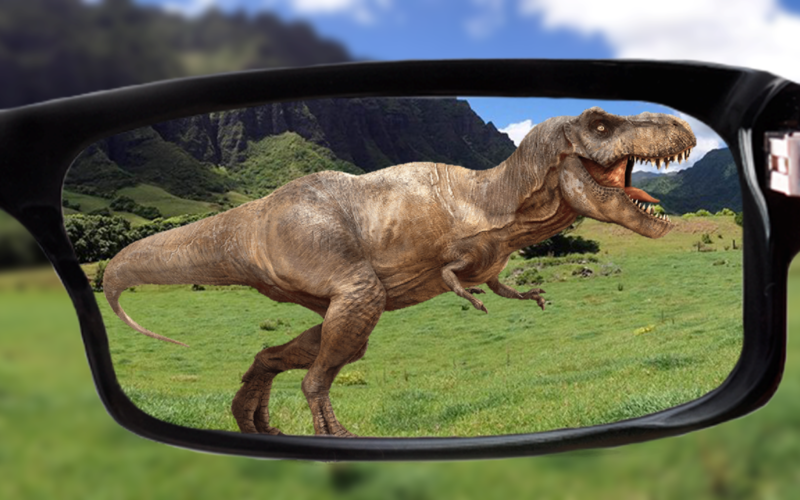 Understanding worldviews can help us to distinguish between what is genuinely known about dinosaurs, and what is merely conjecture, and to discern between conjectures that are reasonable and those that are unfounded. The anatomical structure of dinosaurs has been deduced from their fossils. This is how we know their size and their approximate appearance. We know dinosaurs had scales because fossil impressions of scales have been detected in the associated rocks. Dinosaur footprints have been discovered, which tells us something about the gait of these creatures. For example, tail marks are rarely found – indicating that dinosaurs did not normally drag their tails. In some cases, we find fossils inside dinosaur stomachs, which tells us something about their diet at the time of their death. These are pretty solid conclusions because they are based on evidence and are relatively independent of a person’s view of history. However, when paleontologists begin to speak of when dinosaurs lived, when they died, or the cause of their extinction, a person’s view of history will strongly affect his or her conclusions. Most people have heard that dinosaurs lived hundreds of millions of years ago, and went extinct about 65 million years ago. But few people know that such claims are not based on hard scientific evidence, but on beliefs about the past. Evolutionists require millions of years in order for particles-to-people evolution to sound even remotely feasible. Consequently, they interpret the geologic column (the observation that there is a statistical vertical order to fossils) as having been deposited gradually, over hundreds of millions of years. If this were so, then there can be no global flood, because such a flood could easily deposit the majority of fossils in the geologic column. On the other hand, the Bible records a global flood in which all living, air-breathing land creatures on earth perished except for the representatives of each kind brought on board the ark. Based on the information in Scripture, we know this flood happened around 2350 B.C. If indeed this flood was responsible for depositing the majority of fossil-bearing strata, then dinosaurs cannot have died out millions of years ago, because we find their fossils in these flood sediments. So a person who embraces recorded history will draw a very different conclusion from the person who rejects history regarding when dinosaurs lived and how they died. Most people are familiar with the secular story. Dinosaurs supposedly evolved from a Thecodont ancestor about 230 million years ago, went extinct about 65 million years ago possibly due to an asteroid impact that affected the climate. Their extinction left an environmental niche that mammals then began to fill by evolving into their various forms, continuously tracking with the environment. Some evolutionists believe that some dinosaurs evolved into the earliest birds. In any case, in the evolutionary view, human beings never saw a living dinosaur. Far fewer people are familiar with the biblical, historical position on dinosaurs, and how it is confirmed by scientific discoveries. The Bible has demonstrated itself time and again to be the reliable, historical, Word of God. Therefore, it makes sense to embrace its history, rather than mindlessly dismissing it as so many evolutionists do. So, taking the Bible as the true history of the universe, what can we conclude about dinosaurs? From Scripture, we know that dinosaurs are not millions of years old because the entire universe is not. This is obvious, but it needs to be stated because so many people are uninformed on this issue. God created the universe in six days and rested for one day as the basis for our work week (Exodus 20:8-11). Each day was bound by evening and morning (e.g. Genesis 1:5, 8, 13) – hence an earth rotation. Human beings were made on the sixth day (Genesis 1:26-31). The number of generations between Adam and Christ (Luke 3:23-38) corresponds to a timescale of a few thousand years – about 4000 years using other chronological information in Scripture. This puts the age of the universe at around 6000 years. People have tried to insert gaps to accommodate millions of years, but none have withstood rational scrutiny and will therefore not be repeated here. The point here is simply that dinosaurs did not live millions of years ago – nothing did. Dinosaur fossils formed sometime after Adam sinned. This is another fact that should be obvious, but probably needs to be explicitly defended. According to Scripture, death entered the world as a result of Adam’s sin (Genesis 2:17, 3:19; 1 Corinthians 15:21; Romans 5:12). This is because death is the penalty for sin (Romans 6:23). And since Adam was put in charge of the living creatures, they too suffer death as a result of his sin (Genesis 3:21, Romans 8:20-22). God Himself sacrificed an animal or animals to provide skins of clothing for Adam and Eve in response to their sin (Genesis 3:21). We learn from Genesis 1:25 that God made all the land animals, “everything that creeps on the ground,” on the sixth day. Since all land animals were made on day 6, and since dinosaurs are land animals, it follows logically that dinosaurs were made on the sixth day. Some people are bothered by the fact that dinosaurs are not mentioned by name. But then again, the overwhelming majority of animals that God created are not mentioned by name. We don’t read about monkeys, elephants, or armadillos in Genesis 1. But then again, there is no need to list each species; the term “everything” (that creeps upon the earth) covers all those creatures. Since these are land animals, we know from the text that they were made on day six. So dinosaurs did in fact live at the same time as human beings. Soft tissue from a T.Rex femur shows red blood cells. Science confirms that dinosaurs lived thousands, not millions of years ago. Paleontologists have discovered in some dinosaur remains the existence of soft tissue, including blood vessels that are still stretchy and which contain red blood cells! Mary Schweitzer first announced the discovery of soft tissue in a Tyrannosaurus femur after dissolving the fossilized portions in acid, and several other cases have been discovered since then. It is simply unrealistic to expect the proteins of soft tissue to last for millions of years. One of the proteins identified in some dinosaur remains is collagen, which decays at a known rate and cannot last millions of years. Such collagen has detectable levels of C-14, which cannot last even one million years. The presence of C-14 makes it possible to carbon-date the specimen. The resulting age estimates are always in the thousands-of-years range, never millions. Science confirms biblical history. When God finished His work at the end of the sixth day, He looked at everything He had created and declared that it was “very good.” This means that dinosaurs were originally very good, as was everything else God created. Despite what we may see in Hollywood movies, dinosaurs were not horrible monsters – at least they were not originally created that way. All dinosaurs were originally vegetarian – as was every living creature at the beginning. This often surprises people who have formed their beliefs around Hollywood fiction or secular conjectures, but the Bible is explicit. In Genesis 1:29-30, God tells Adam and Eve that He gave them plants and fruit from trees to eat, and also to “every beast of the earth,” and “every thing that moves on the earth which has life.” Again, dinosaurs are things that move on the earth and have life. Therefore, they were originally to eat plants for food. Even if these verses didn’t explicitly state so, we could still know that all animals were originally vegetarian because there was no death of the living creatures before Adam sinned. Thus, there was no meat to eat. “But some dinosaurs had very sharp teeth! So they must have been meat-eaters. Right?” No. There are some animals today that have very sharp teeth that are mostly or entirely vegetarian, such as a fruit bat. Some plants are very hard and require sharp teeth to eat. You cannot tell from teeth alone what an organism eats. It was only after Adam sinned (and as a direct result of it) that death entered the world. Carnivorous activity could not take place before that time. The Bible does not state when animals began eating meat, though it does say that humans were given permission to eat meat after the global flood (Genesis 9:3). But we have good evidence that a number of animals had developed a taste for meat by the flood year. The fossils that we believe to be associated with the flood occasionally still have remnants of their stomach content – which sometimes includes other animals. We also find coprolites (fossilized dung) which contain digested material. So, there is evidence that some dinosaurs became meat-eaters at some point in history. These were mainly the theropods. But the majority of dinosaur kinds, including the sauropodomorphs and all the bird-hipped dinosaurs, apparently remained vegetarian. On occasion, critics will complain that dinosaurs are not mentioned by name in Scripture. But there is a good reason for this. The term ‘dinosaur’ was coined in 1841, centuries after the Bible had been translated into English. So, of course we will not find a word that did not exist at the time. If dinosaurs are mentioned in Scripture, they will be called by a different, more ancient term. One such English word that would fittingly apply to a large reptile like a dinosaur is ‘dragon.’ The word ‘dragon’ is indeed found in many English translations of Scripture. Could some of these be dinosaurs, and are there any other terms that might be describing dinosaurs? Apart from the Bible, are there any historical records of humans encountering dinosaurs? If so, when and how did dinosaurs go extinct? Continue to part 2.